Ground roll and climb out RPM? I had an RV 6 a with 0-320 Lyc and a Sensenich coarse pitch ,wood prop. My climbs sound very similar, but # 1 & 2, very easily went above 400 deg F after lift off and climb at 90kts. My fuel flow was ok and baffles were ok, so as others have suggested ,I lowered the nose to 120 kts and found temps improved with altitude. I had the plane for 8 years and it was ok. As I needed better climb on my short strip, I built RV7a 180 hp and constant speed prop. This is safer for me, especially when hot weather and full load. Appreciate the info guess it's doing what it should for the current set up. A little recent reading made me think k a catto prop might help somewhat. While I'm not a builder if I happen to give advice , I will not be responsible for damage to equipment, your ego, parts, world wide power outages, spontaneously generated black holes, planetary disruptions, or personal injury that may result from the use of this advice. Ten to fifteen degrees of flaps will help you get "unstuck" faster and so will raising the nose as soon as you're able. However, raising it more than a couple of inches above the grass will detract from your performance. Also, 10 feet is far too high to take advantage of ground effect. I don't have a "6", but the speeds you're using don't sound appropriate for Vx and Vy. Too slow also detracts from performance. Your aircraft with an O320 and FP prop should out-perform a Cherokee 180. Finally, you might also check your tire pressure (45-50 psi) and the ground clearance of your gear fairings. Once it's (RV) at 100 mph or better that's a different story, but the archer I can pitch up and hold at vy all day long without it getting hot and it klimbs out nicely. Love my 6 and it does a lot of things wonderfully, but climbing out isn't one of them. I do take off with the flap setting recommended by many on vaf set with my Angle finder and marked. Plain and simple this 6 needs to be moving fast to climb out well. Flying my 180 fixed pitch RV-6A solo I see initial climb rates (down near sea level) of 1800+ FPM. I would call that climbing well. A 180 HP RV-6(A) with a properly matched propeller, at its worst, will out climb a Piper Archer on its best day. Sure, it does it at a higher airspeed but it also accelerates to that speed in the same amount of time it takes the Cherokee to get to Vy so it doesn't matter (BTW, most people climb at 120 or so... it only gives up a small amount of climb rate but does help cooling). Any opinions expressed in this message are my own and not necessarily those of my employer. Aircraft Speciality has a stage 3 cam grind that will wake that engine up. Couple that with a good port and polish job on the heads and finish it off with 9.5/1 pistons and you should be good to go. However, you may have to ditch that metal prop after making all these changes and go with a Catto. I'm not a fan of 10:1 and higher compression if engine longevity is a consideration. Good luck with your RV! No one sells a hotter cam for these babies to wake them up huh? Could use a little more HP  How about ported heads ? Actually I've been told push rod length could make some difference? I did just shimm the mounts for better alingmeng with the cowl which I felt would help my cooling as well because the baffling is getting closer to the cowl for better sealing? Thank you to all who have replied btw.. I very much appreciate the help. Y'know, everything is a compromise with a fixed pitch prop. I have a 6A with 160hp engine and 80" sensenich, I get around 2250 rpm on the runway and can overspeed the prop (over 2600rpm) at low level flat out, I don't know by how much, I am not brave enough to find out. Climb rate at max weight is around 1100fpm, but at 110kt+. I also have a low pitch wooden prop, it will turn 2350 on the runway and climb really strongly. It is also 10kt slower (at 2700rpm) than the Sensenich at 2600. But the engine will rev to 2900rpm and the airplane will be doing 10kt faster than the Sensenich at 2600. I have tried several wooden props, so far the Sensenich is the best compromise for the flying I do, most of the time. Better clmib performance is always available if you are willing to trade cruise speed. The folks who have posted have reflected my experience - take-off and climb in these airplanes changes a lot with weight, and climb rate is constant over a wide speed range, but CHTs reduce with a higher climb speed. I tend to accelerate balancing on the main wheels, lift off at around 60kt, start agentle climb immediately aiming for an initial climb speed as low as 80kt (90mph) to clear trees, then accelerate to normal climb speed. The only silver bullet is a constant speed prop. By all means try a Catto prop, but don't expect a significant change in performance at both ends of the envelope. Ok so an update, my prop is a 70cm 79 pitch Don’t know if anyone reworked it. I see between 2150and 2200 on the runway. And today I pitched it for 100 mph it climbed out at 700ft per minute. This was a light rainy day at about 60 degrees. Two occupants approx 200 lbs each and 15 gallons fuel per tank. I should add that compressions are all good on the engine 78/80 or better, and the engine only has approx. 250 on it smoh. Last edited by Turbo69bird : 04-27-2018 at 08:59 PM. You took off at a few pounds over gross for the RV-6 (~1680 lbs). I would consider 700 ft/min at that weight with an O-320 turning a cruise prop to be excellent preformance. You have a good airplane. Last edited by Sam Buchanan : 04-27-2018 at 09:32 PM. 200+200+(15+15)*6 = 580? My -6 is only 999lb, that would put me at 1579. I didn't see his empty weight specified? I didn't see empty weight either so made a fudge factor guess of 1100 for the RV-6A. Our planes get heavier with age (and all the stuff we haul arround...). All times are GMT -6. The time now is 08:12 AM. 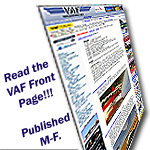 The VAFForums come to you courtesy Delta Romeo, LLC. By viewing and participating in them you agree to build your plane using standardized methods and practices and to fly it safely and in accordance with the laws governing the country you are located in.